Although our Alpine Dessert Wine can be sipped on its own for dessert, its high alcohol content is better managed with accompanying food. There are many versions of this dish, but the nutmeg and apricot jam in our version bring out the fruit and spice in the Alpine Dessert Wine quite nicely. We use our own apricot jam made with fruit picked on our estate and apples from across the road, to make this deliciously local (and stunningly beautiful!) dessert. Combine 2 cups water and lemon juice in a medium-sized microwaveable bowl. Core the apples, then cut in half and slice thinly, the thinner the better. Make sure that some of the red skin remains on each slice, to create the petals of the roses. Add the apple slices to the lemon water, to prevent browning. Microwave apples for 3-4 minutes on high. Roll out puff pastry sheets slightly on a floured surface. Cut each sheet into 6 strips (12 total). In a small microwaveable bowl, mix apricot jam and 4 Tbsp water. Microwave for 1-2 minutes, and stir to combine. Spread on pastry strips. Place apple slices overlapping on one side of the pastry strips, with the rounded red-skinned edges poking off the top of the strip. Sprinkle with nutmeg. These are your rose petals. Fold the pastry strip over the bottoms of the apple slices, then roll the strip with the apple slices to form a rose shape. Repeat with remaining strips. 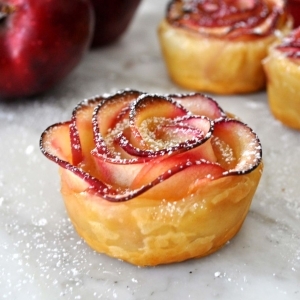 Place apple roses in the cups of a muffin pan in the center of the oven and bake at 375 for 45 minutes. Remove from muffin pan and allow to cool slightly before serving with Stone Cottage Cellars Alpine Dessert Wine.